STAPLES Center has teamed up with the United States Department of Homeland Security on the ‘If You See Something, Say Something’ campaign. The campaign is a simple and effective program to engage the public to identify and report indicators of terrorism, crime and other threats to the proper transportation and law enforcement authorities. 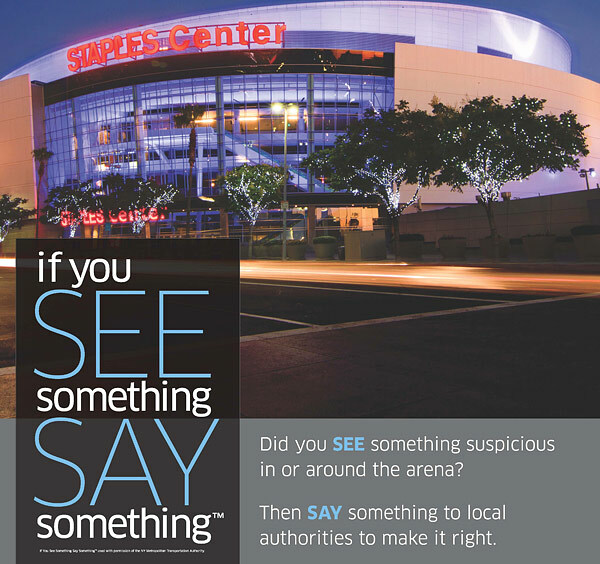 While at STAPLES Center, Microsoft Theater or the LA LIVE campus, if you observe suspicious activity, please report it to the nearest security officer, guest services team member or law enforcement personnel.